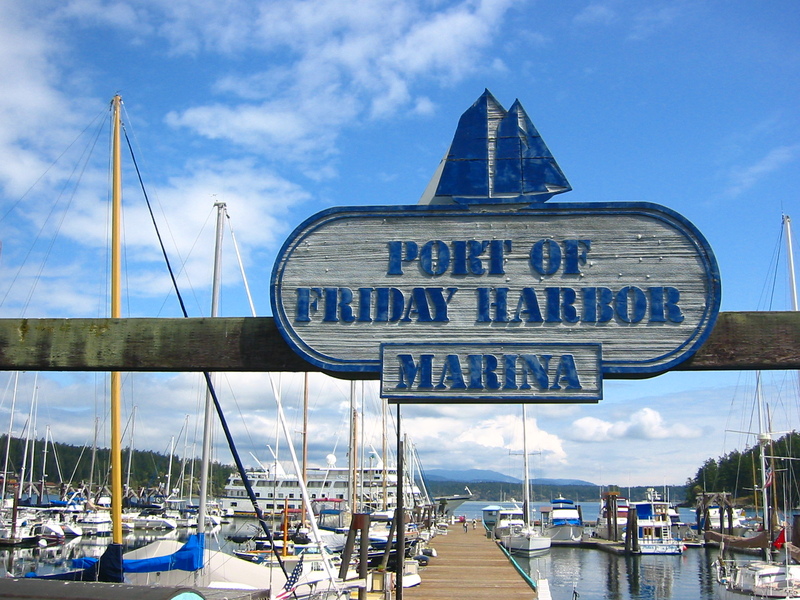 5 ideas for foot-ferry fun in Bremerton, Bainbridge, Kingston, Friday Harbor and more! As any Puget Sounder knows, ferry travel around here can be either, well, a nightmare (hours-long line, restless kids, endless snacks) or a ferry tale (you drive right on and enjoy a scenic, leisurely trip punctuated by whale-spotting and a gorgeous sunset). And it can also be expensive — almost $50 round-trip to Friday Harbor in peak season for a vehicle and one driver. 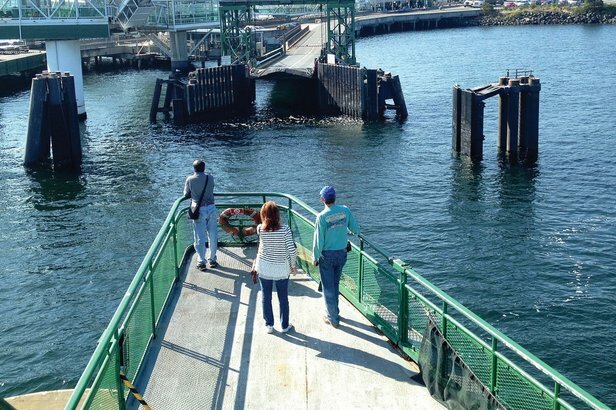 The debut of a San Juan Islands ferry reservation system last year will help alleviate some ferry stress, but we still love the car-free solution, especially for day trips. First, no need to show up super early; simply park and amble on. Second, as any parent knows, just being on a ferry is magic for kids: Seagulls! Sea lions! Popcorn! Long stretches of ferry deck to run around on! Once you’ve walked off, depending on your destination, you could tour a Navy warship (Bremerton), play at a children’s museum (Bainbridge), eat a scoop of world-class ice cream (Kingston), visit a whale museum (Friday Harbor) or while away the day at the best sandy beach in Puget Sound (Jetty Island). Here are five ideas for foot-ferry fun, followed by some simple variations. Where to get the ferry: Board at the Pier 52 ferry terminal in downtown Seattle near the aquarium. Park in a lot, or on Sundays, you’ll find free street parking. Bonus points for taking public transit to catch the ferry. Ferry fare $4–$8, free for ages 5 and under, schedule here. Crossing time and tips: About an hour. Note: The relatively long ferry crossing makes this a fun outing for just the ride alone. What to do in Bremerton: The secret is out about Bremerton’s wonderful, compact waterfront — steps off the ferry landing — with stroller-friendly boardwalk paths. Kids who love weapons and control panels (e.g., my 5-year-old son) will especially enjoy touring the Navy Destroyer USS Turner Joy, which was deployed during the Vietnam War ($7–$12, kids 5 and under free). 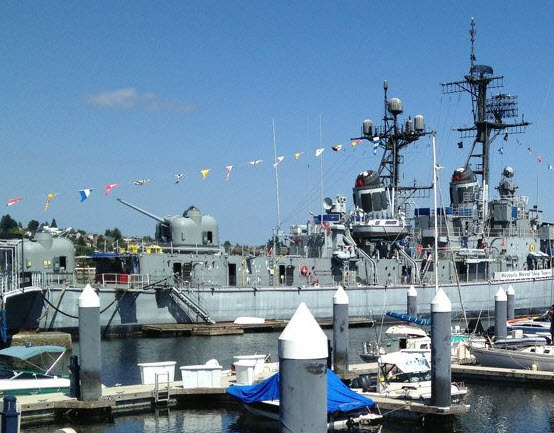 Even closer to the ferry is the free Puget Sound Navy Museum, which offers interesting exhibits about Bremerton’s illustrious naval history, exhibits on naval intelligence and a children’s room where kids can dress up in sailor outfits and play in a submarine. 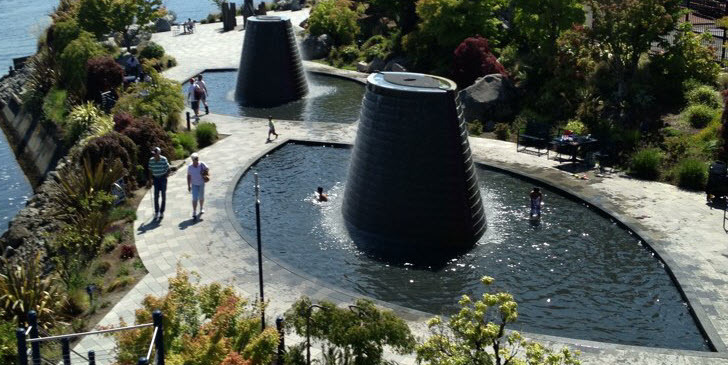 But the summer highlight might be the Harborside Fountain Park, a series of volcano-like fountains that accommodate many whooping kids on hot days without feeling crowded (note: as of April 2016, the fountains were down for maintenance). More: There’s a puppet museum, and on Sundays the farmers market is right at the terminal. Where to nosh: Fuel up at Taco del Mar, around the corner from the ferry landing, or — right next door — at Fritz European Fry House, which specializes in Belgian fries. For fancier eats, head to Anthony’s. Bonus transit tip: You can also take a foot ferry from the Bremerton ferry terminal to downtown Port Orchard (weekdays and Saturday). Where to get the ferry: Also board at the Pier 52 ferry terminal in downtown Seattle; again, park in a lot, or on Sundays find free street parking. (Tip: Pick up Top Pop Doughnuts on the pedestrian bridge.) Ferry fare $4–$8, free for ages 5 and under. Schedule here. 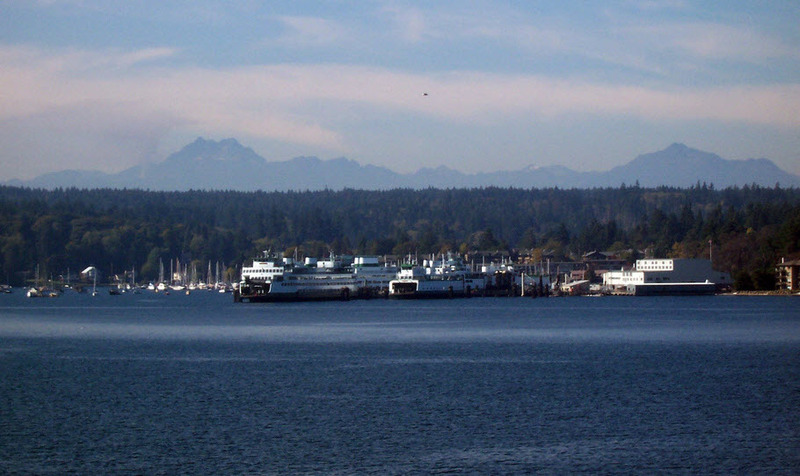 What to do on Bainbridge: Once you’re off the ferry, it’s only a few blocks to the lovely town of Winslow, packed with natural and cultural (and edible!) activities. On a sunny day, wander the waterfront trail from the terminal to the Waterfront Park, which borders downtown, to play on the beach or playground. You can also rent kayaks, canoes or paddleboards at Back of Beyond Outfitters ($22 for an hour on a double kayak). On a so-so day, head to Kids Discovery Museum, a small but lively children’s museum with highlights including a pirate treehouse ($5–$6). Just next door, browse the small, friendly Bainbridge Museum of Art (by donation, biartmuseum.org) or hang out at the outdoor plaza, where kids will head straight for the fountains and rocks. Two blocks away explore the island’s history at the Bainbridge Island Historical Museum ($3–$4, kids under 10 free). Where to nosh: Pick up picnic fixings at Town & Country Market, a stone’s throw from the playground, or fill carbo cravings at Blackbird Bakery. The Alehouse on Winslow, near the water, earns reader raves. Eat a wafflewich for lunch at retro-fun Madison Diner. Mora Iced Creamery, an Argentinian shop that also has locations in Kingston and Poulsbo, is a must-nosh for super-gourmet flavors. Bonus transit tip: Explore one of Bainbridge Island’s most magical places, Bloedel Reserve, car-free, by hopping on a Kitsap Transit bus at the ferry terminal. Bloedel is one of three scheduled stops on the island. If you call two hours in advance, you can also reserve a bus ride elsewhere on the island via the Dial-A-Ride service (1-844-4BI-RIDE). 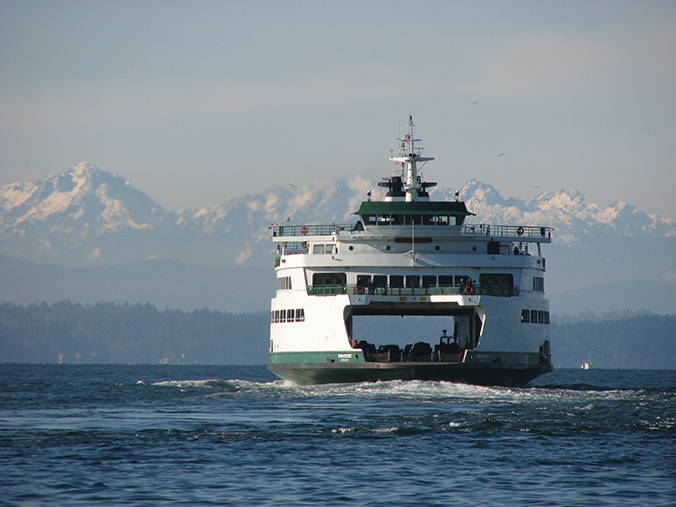 Where to get the ferry: Catch it at the terminal in downtown Edmonds. You can often find free three-hour street parking near the ferry (harder on sunny days). Or to secure more time, park in a lot. Ferry fare $4–$8, free for ages 5 and under. Schedule here. What to do: While Bremerton and Bainbridge offer museums and other rainy-day fun, Kingston — the gateway to the Olympic Peninsula — is at its best on a sunny summer day. Go on a Saturday in July or August, when you can explore the town before settling down at Mike Wallace waterfront park for the farmers market (9 a.m.-2 p.m.) or a Saturday evening concert in the park (5-8 p.m). For a thrill, rent a stand-up paddleboard or kayak from Kingston Adventures, located a few blocks from the ferry terminal ($13 an hour). And then there’s the ice cream — a destination activity in my family’s book. Decent scoops are served up at several places that are close to the ferry landing, including J’aime Les Crepes and Mora Iced Creamery. Where to nosh: Want more than ice cream? J’aime Les Crepes is also a favorite for its to-go crepes (plus ice cream, coffee and more). If microbrew is more your style, head to the Main Street Ale House. Bonus transit tip: Feeling adventurous? From Kingston, take a Kitsap Transit bus to Poulsbo, where you can explore the Scandinavian-inspired downtown and pick up some Viking treasures. Where to get the ferry: Because of the less-regular San Juan Islands ferry schedule, this trip is better as a weekend jaunt (though it can be done in a day). At Anacortes (1.5–2 hours northwest of Seattle), park in one of three pay lots above the ferry landing, where you can leave your car for up to several days. 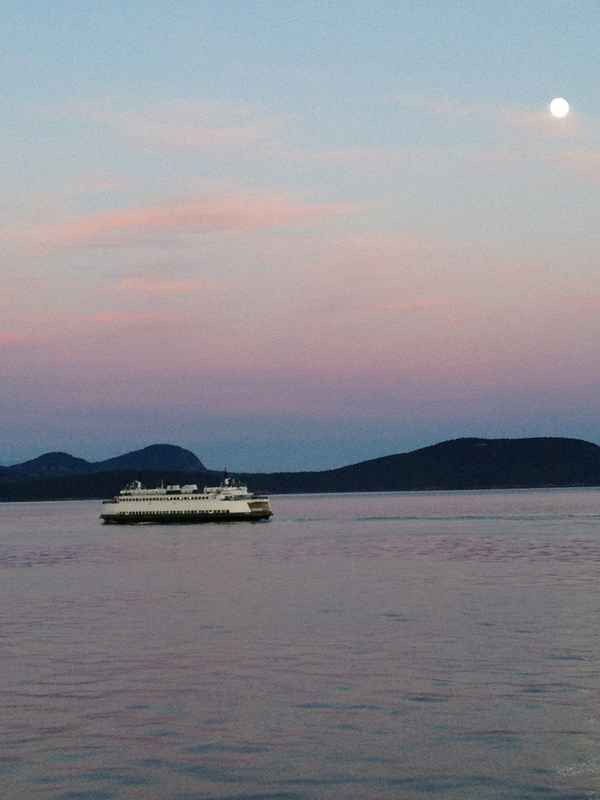 Review the ferry schedule carefully because not all San Juan Island–bound ferries stop in Friday Harbor; ferry fare $6.45–$12.95, free for ages 5 and under, schedule here. What to do: Picturesque Friday Harbor — home to world-class marine science laboratories, a fantastic whale museum and loads of outdoor activities — can easily fill a weekend of family fun. Hear and see orca tales (and skeletons and much more) at the Whale Museum, which opened in 1979 as the first museum in the country devoted to orcas ($3–$6, kids under 5 free). Or visit the San Juan Historical Museum’s new Museum of History & Industry, which this summer will debut the first exhibits in an educational, interactive space; the museum also hosts summer concerts on Wednesdays in July. On a rainy day, A Place to Play is a fun stop with young kids ($7.50 an hour). On a sunny day, take a self-guided walking tour of the harbor; rent bikes at Island Bicycles for a pedal-powered tour; or skim the water in a kayak (find outfitters here). Or up the thrill quotient by booking a San Juan zip tour ($76–$86, for ages 8 and up). For some motorized fun, rent a scoot coupe (essentially a two-person moped) at Susie’s Mopeds; kids 5 and up can ride as passengers ($70 per hour, $150 per day). Find more activities here, including multiple festivals, from the National Historical Park Encampment in July to the Friday Harbor Fly-In in August. Where to nosh: Pick up gourmet picnic fare at The Market Chef or try inspired Mexican fare at Pablito’s Taqueria. Coffee shops abound, and next to the ferry terminal you’ll find the requisite ice cream spot, Friday Harbor Ice Cream Co. (cash only). Foodie families won’t want to miss a stop by San Juan Island Cheese. Where to stay: Good choices for families include Earthbox Inn (with on-site spa and indoor pool) or Friday Harbor Suites, within easy walking distance; or a house via VRBO. Where to get the ferry: Catch the five-minute foot ferry (think small boat) from the Jetty Island landing and boat launch in downtown Everett (10th and W. Marine View Drive) from July 5 through Sept. 7. Free, but boarding passes are required, and you may have to wait in line on busy days. Tip: Get a posse of eight together so you can make a reservation ahead of time. The parking fee is $3. Find the schedule here. 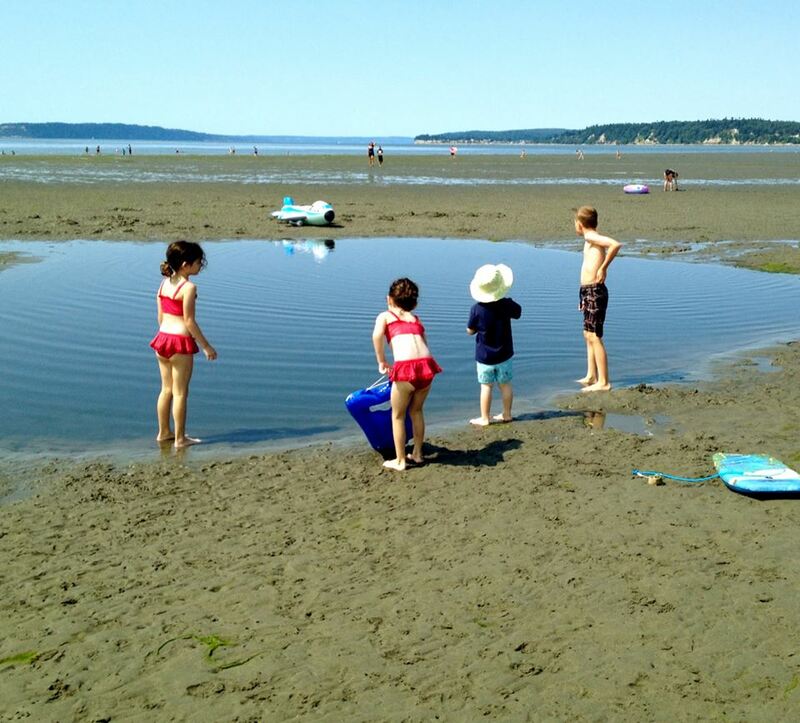 What to do: Jetty Island is one of Puget Sound’s best kid beaches, a two-mile oasis of sand and mud flats, driftwood and marshland grasses, and — best of all — shallow warm water. Mud and tide provide all the drama kids need, but you can also participate in any number of Jetty Island Days nature and arts programs offered all summer. Tip: Avoid crowds by going on a weekday. Where to nosh: You’ll need to bring all your food or water to this road- and retail-free island, but the kiosk on the mainland, next to the dock, sells treats such as kettle corn (our favorite) and ice cream bars. King County Water Taxi: Recipe for a sunny day: Bring bikes to Alki (or rent) then roll on down the wide Alki trail to the King County Water Taxi. Cycle to the Olympic Sculpture Park and explore art and the pocket beach before looping back. Guemes Island: Catch the small, vintage ferry from Anacortes to this gorgeous, oft-overlooked San Juan Island — just make sure to time your trip before or after the ferry staff’s lunch break. Five minutes later, on the Guemes side, grab lunch or ice cream at Anderson’s General Store. Victoria, B.C. : The queenly city is possibly the best walk-on destination in the Northwest for a weekend getaway, with whale-watching, parks, world-class museums and high tea at the Empress all accessible by foot. Arrive by Victoria Clipper from downtown Seattle or by Black Ball Coho ferry from Port Angeles. Whidbey Island: Catch the ferry for this slim, stunning island in Mukilteo, where you can explore the Mukilteo Lighthouse Park before boarding. Once you’ve crossed to Clinton, hang out at the beach or take an Island Transit bus to walkable, charming Langley.